This is the first of the three Giant's levels to clear, or rather it's the first one that I did, you could do them in reverse order if you wanted to. Upon first entering, follow the passage until you can see some Giants standing on the other side of a chasm. I usually use distance attacks to kill them, before proceeding down the corridor. Keep going down the passage until you can see the lava just to the south of you. There's a couple giants here, and once you've dealt with them cross over the bridge to the south. In this section are some Ogres, including an Ogre Mage. Kill them all and take note of the Mossy Boulder to the northwest and the Stalactites to the east. Now head east, over another bridge and then north. You'll find yourself in the same area where the first giants were. Check the chest for the Move Mountains spellshard. Go all the way down to the south now, and take note of the long passage leading to the east, don't go through it yet, but remember where it is. Head back to where you fought the ogres. The mossy boulder, which you need Move Mountains Lv.3 to pass, blocks a secret passage into an ancient temple. The only thing to note about the temple is that the floor will damage you. You can't perform the Ritual of Sanctification on the altar, and there isn't anything to pick up in there. 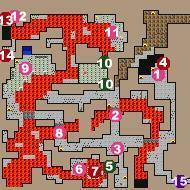 Continuing directly north of the secret passage is another secret passage leading out into some lava. Unless you have a high Pathfinder skill you probably want to cast Safe Travel Lv.3 before entering this area. Pretty much right away you're going to have to fight three Efreet. They aren't that difficult to kill, and they quite often drop Torcs and Gold Braceletes when you kill them. Go back to where you fought the Ogres and use Move Mountains Lv.2 or a Stoneshatter Crystal on the Stalactites. There's another secret passage back here, and once you step through you're going to have fight some Black Shades and Demons. It's worth it to do this as early as possible however, because on the platform in the middle of the room is Giantslayer. Once you have that, head back out to where the ogres were and go west along the passage. There's another bridge over the lava leading north, so follow it along, and over yet another bridge leading west. Right after this bridge is the Forge itself. There's a lot of Giants in here, including a Hill Giant Chief. This is a good time to mention a few things about HIll Giant Chiefs. First off, they always carry Invulnerability Elixirs, which they use at the beginning of every battle, so unless you somehow manage to kill it before it takes it's first move you might as well just ignore them while you deal with other enemies in the room. Once everyone else is dead move at least one of your characters right next to the Chief so that he'll stop throwing rocks at you. The invulnerability elixir will eventually wear off, and then they aren't that hard to kill. They always drop Shield Rings, and occasionally they drop other magical items as well, so it's worth your while to check out what they were carrying. Once you've cleared the forge head onto the lava, using Safe Travel Lv.3 if necessary. Follow the lava stream north and then west. In the far northwestern corner is a Demon guarding a Resistance Ring. The Firewalkers Band is nicer than the Resistance Ring, but the ring itself is nothing to sneeze at either. South of the demon is another short passage leading south. Where it dead ends are a few Magic Lockpicks on the ground. You might want to pick them up for the final level. That pretty much clears this area, so now go down to the southeastern corner and down the passage to the Lower Giant Caverns.